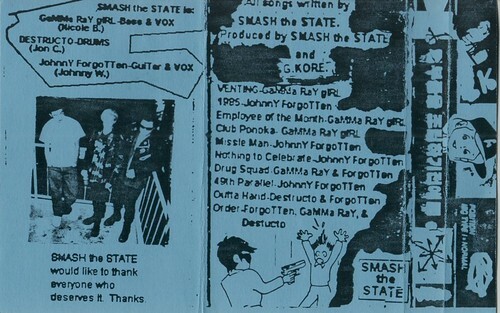 I never actually saw Smash the State play (I think they only did one or two shows), but they gave me a copy to play on my radio show, and then called in and threatened to beat me up when I made fun of them on the air. It's actually better than you'd expect, in a Ramonesy sort of way. John Wenkoff (He always preferred "Johnny Forgotten". I have no idea why, since I can't think of a punker last name than "Wenkoff". It's even punker than "Izzo"!). haha, "would you like some fires with that?"... 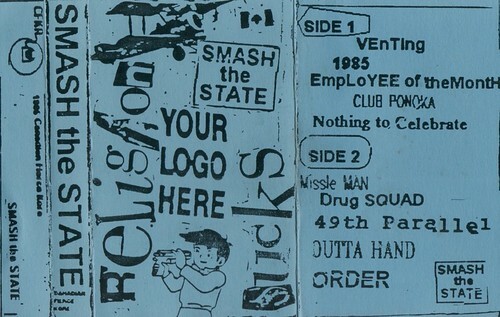 I used to skate with Jon at the ACA parkade, till the skins went to war with the skate punks and glued freakin' rocks on all the curbs and painted over the crappy graffiti of aliens and such... Hey, wasn't Wenkoff in Smidgen? Dude, I think it was John that glued the rocks all over the place! Smigin was him, Randy Rudland, and some other dude. I think his name was Jeff. A friend sent me the link to this website, hilarious. Smash th State actually played about 35 or so gigs all over the place - some big ones too. I still have every ratty gig poster on my gargage wall. Dont remember gluing rocks all aver the ACA skateboarding place, but I do remember getting blamed for it.